Dimensions: Gift-Box: 5 1/4" x 3 1/2" x 4/5"
Keeping drinks cool has never looked so luxurious. 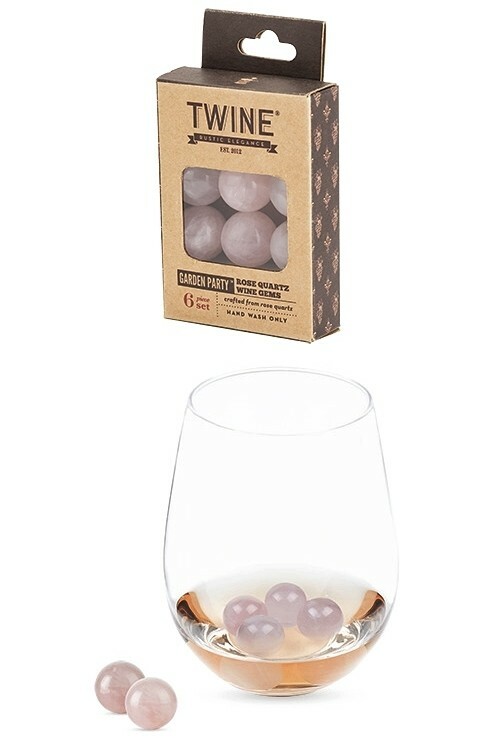 Simply freeze these polished rose quartz wine gems, place in your glass, and enjoy an evening of pure, undiluted libation. Includes storage pouch. Keeps drinks colder without dilution. Freeze for four (4) hours before use. PLEASE NOTE: Pictured stemless wine glass is not included. Sold as a set of six (6) and the prices quoted below are per set.